One thing has been very clear during my pregnancy. Morning times are sometimes the hardest for eating purposes. I always eat breakfast, I know the importance of it; however, many times throughout my pregnancy, the thought of certain food (eggs) make me cringe. 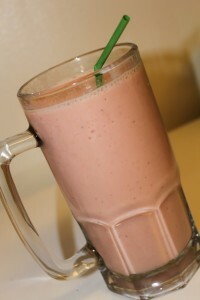 One thing that I have always enjoyed though is making fruit smoothies. It fills me up, is amazingly healthy, and gives the baby so many great nutrients. This fruit smoothie recipe is amazing, packed full of flavor, and nutrients making it perfect for pregnancy. Throw everything into a blender. Blend on high until well mixed. Add more ice or juice as necessary to reach desired consistency (ice will make thicker, juice with make thinner). **One great thing about smoothies is that you can change them to taste like whatever you want. Change the yogurt flavor, add different fruits, use OJ instead of the Silk juice. It’s really up to you! Enjoy! **If you are breastfeeding and have eliminated dairy due to allergies, the silk fruit juice is dairy free! Just remove the yogurt, and add some more fruit! Yum! That sounds delicious. I&#39;m have everything on hand except the yogurt. Will be going to the grocery store on Monday and will add this to my list so I can make this. I love smoothies! We make them all the time as healthyish late night snacks! This sounds yummy…. even for Grandmas! Can&#39;t wait to try it and sounds very healthy! I am currently breastfeeding and I love this idea. Sounds super yummy/easy. I know certain foods I have to stay away from because they mess with my sons tummy so I know I&#39;d be safe with this. I&#39;m always looking for new smoothie ideas. Thanks! This sounds like an excellent smoothie – I&#39;ve not yet tried Silk Fruit &amp; Protein juice, but this is a good recipe to try it! My daughter loves smoothies. Way better than drinking soda.